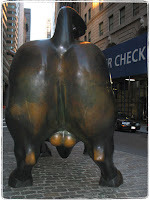 Hedge Fund Blogger.com: Hedge Funds Face Financial Ruin! Hedge Funds Face Financial Ruin! Here is a blog post that generalizes hedge funds as speculative risky/leveraged vehicles which are "facing financial ruin." Within the article Dean Baker discusses some current issues in the market which are a whole separate discussion but he starts by saying "Hedge Funds are facing financial ruin." While a few hedge funds are always facing financial ruin here are 4 points on why the whole industry is not. 1. There are 10,000 reported hedge funds and probably closer to 15,000 total in existence. Of all of those only around 80 have reportedly closed in 2007. 2. Hedge Funds employe literally hundreds of distinguishable strategies only some of which use leverage. Even if one whole strategy took 20 hedge funds off the map that would be a blip on the radar of this $3 trillion industry. 4. Last month a report came out from the Institute of Private Investors surveyed the ultrawealthy and 25% reported that they would be increasing their allocation to hedge funds, not decreasing it. This is one of the reasons why I am writing this blog. There is a large disconnect between the sophisticated investor's knowledge of how hedge funds are run and the general publics view of what a hedge fund is.